When we sat down with EJ Lighted to conceptualize this styled engagement shoot for Lynette and Shaun, we knew we wanted to do something a little bit different that you don't see in your everyday engagement shoot. The original concept we thought of was to have a bride alone waking up on a bed in the middle of a wide open field with the sun rising setting behind her in the dreamiest of settings - and then be greeted by her groom who would magically appear to greet her. As we were brainstorming, Elizabeth came up with the idea of a romantic rowboat concept, where the bride would be floating along a gentle waterway with her groom on a rustic rowboat. 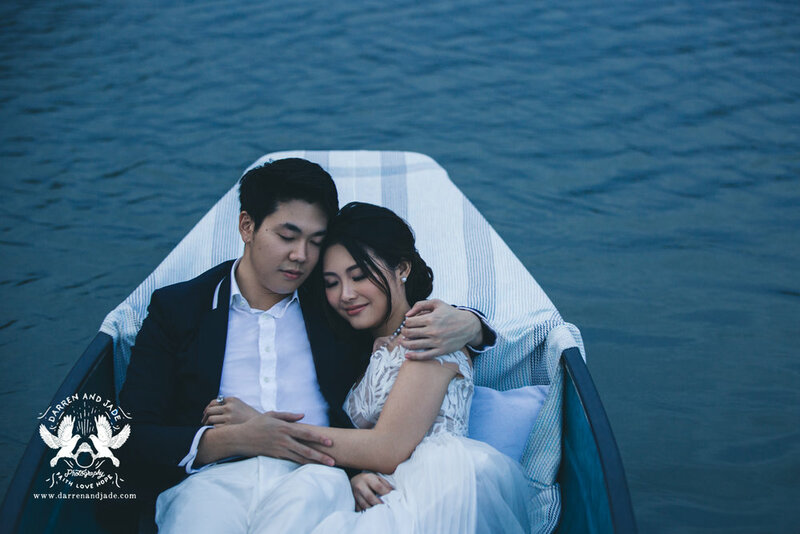 We then thought, why not combine these shoots and connect them from a storyboard perspective - the bride could be whisked away by her groom to this rowboat setting after waking up and spending a few precious moments together. With that, what had originally started as a single concept, 1 day shoot ended up being a fuller story shot over 2 consecutive days. Elizabeth then found Lynette who ended up being exactly what we were looking for - someone who could bring out the soft and dreamy look we wanted, while also being engaged herself. She had been asked to model for previous bridal shoots before but declined every one of them as she wanted her first bridal shoot to be her actual one with her eventual fiancé! So with that, we ended up having her fiancé Shaun along for the ride as well. Logistically both shoots were a lot of work to pull off. The first day, we ended up taking a boat out to shoot in the waters outside Ubin with storm clouds trailing us and ended up taking a boat ride back to Singapore in the middle of a thunderstorm with all of us getting completely drenched! On top of that the currents were pretty strong so Shaun had to paddle the boat back into position every time as it was constantly drifting away from the camera! The second day, we encountered (yet another) thunderstorm and were left with only just over an hour to shoot before sunset! Thankfully we were all really happy with the photos in the end and we can't thank all our collaborators enough for their perseverance to turn this shoot into something special. 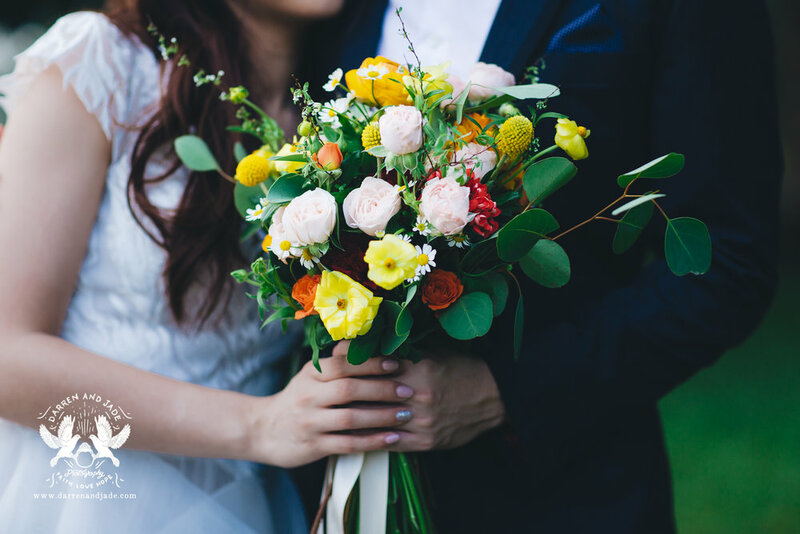 To EJ Lighted for doing all the planning, logistics and coordination - you are two of the most talented wedding planners we've been blessed to work with, and really pulled off the look for this shoot! 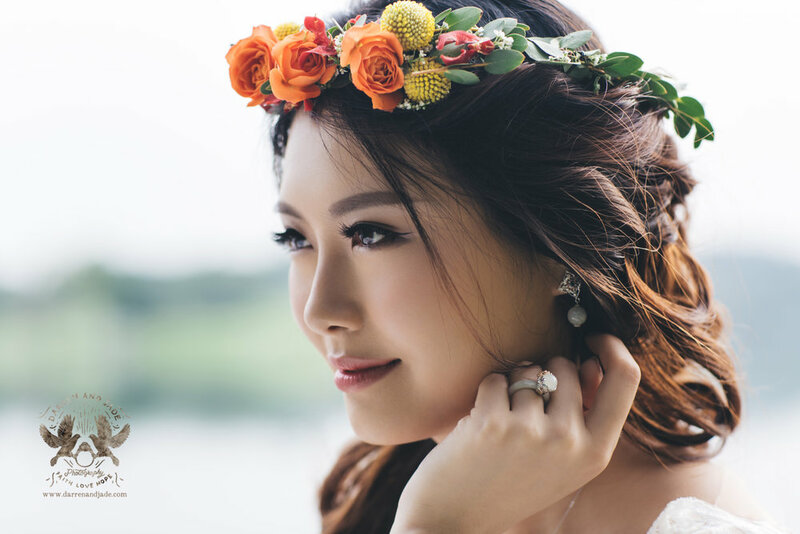 To Lindalino Makeup, for always being so incredibly with your ability to make all your brides look beautiful. To Lynette and Shaun for having us be part of your wedding story and being so fun to be around during the entire 2 days! And finally to Ethereal, Q Menswear, Flowerstory, and Choo Yilin for providing us with such incredible gowns, suits, blooms and accessories that really made the look of this shoot all that much more magical!